"Dawn of the Liberators" was created as a tribute to the aviators whose bravery contributed to the Allied victory in World War II. The painting was commissioned as a memorial to artist Howard Terpnings brother, First Lieutenant John E. Terpning, who paid the ultimate price to secure American freedom. First Lieutenant Terpning was a pilot in the crew of B-24D Bomber 42-20525 which was lost over New Guinea on May 7, 1944. 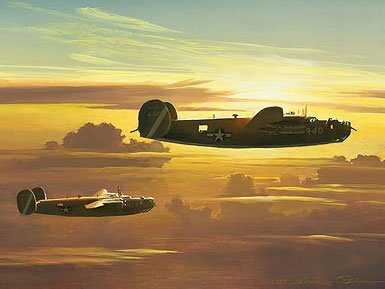 As they fly into formation on the way to their targets, two B-24s of the 43rd Bomb Groups 64th Squadron climb into a Pacific dawn. Although they were historically eclipsed in number by their European counterparts, the B-24 Squadrons of the Asiatic-Pacific theater fought a relentless and determined enemy in an unforgiving environment to ensure safety for the Allied nations.